Piedmont’s nebbiolo grape at its best makes lighter coloured reds with floral perfume, intense flavour and assertive tannins that, in conjunction with the fruit, give savour and length. But buying nebbiolo’s a minefield as they’re expensive but all too often ordinary or simply too tannic to be enjoyable. I’ve found this to be the case even with wines from the variety’s heartland in the Piedmont towns of Barolo and Barbaresco. However, the good ones are unique and beautiful wines to savour. In the last few weeks I’ve come across three successful Australian versions and one decent original from Barolo, Italy. Canberra winemaker Bryan Martin buys nebbiolo grapes from Brian Mullany in the slightly warmer Hilltops region, a two-hour drive north of the Capital. In 2016 Martin combined the favoured MAT3 nebbiolo clone, noted for its big bunches and small berries, with smaller batches of other unidentified clones. Martin de-stemmed the bunches and moved the uncrushed whole berries to a 1,000-litre open-top cuve, made from French Allier oak by Italian cooper Garbellotto. After the wine’s long skin maceration and fermentation, Martin clamped a lid on the vat to allow further skin contact while excluding oxygen. 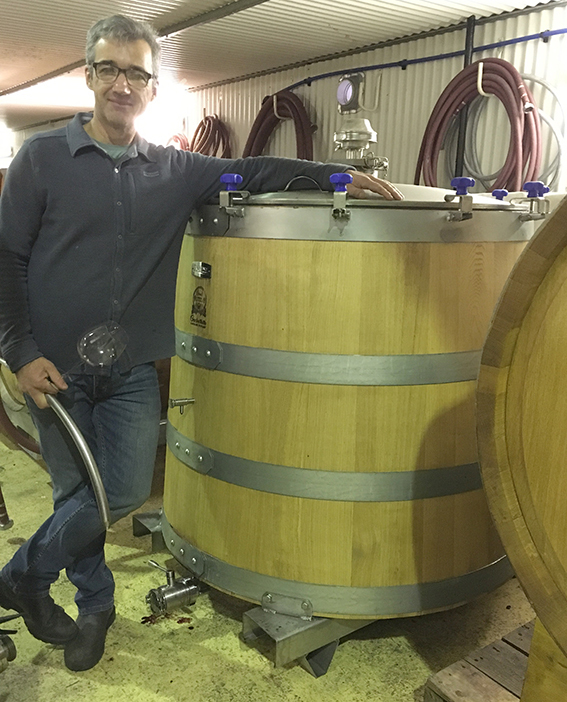 Eight months after the berries went in, Martin moved the wine unfiltered to 2,000-litre oak foudre for 14 months. I tasted the wine from cuve a few months after vintage and noted the brilliant crimson colour, floral aromatics, intense raspberry-like fruit flavour and fine but assertive tannins. Some months later the same wine, now in foudre, impressed for its finesse and silky tannins. Another year on and the bottled wine delivered on its earlier promise: limpid, youthful colour; floral and savoury aroma; subtle but assertive palate, revealing deep, sweet underlying fruit flavour bound with savoury, soy-like character and firm but smooth tannins. 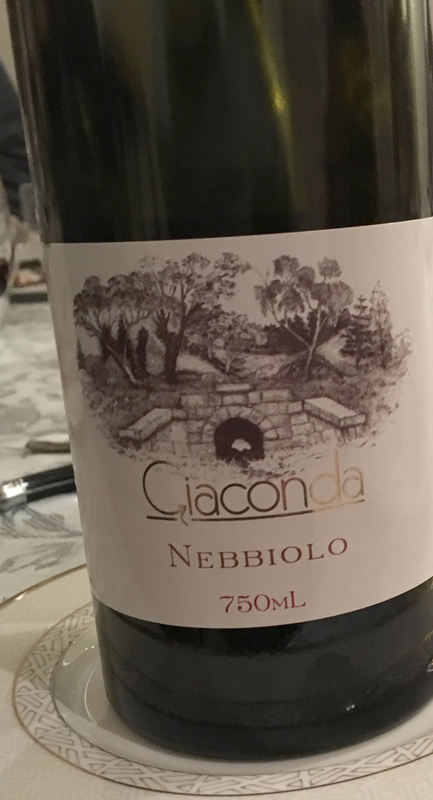 This is a very good, distinctive nebbiolo and I suspect it will age well. But it’s early days yet for the variety and only time will tell. However, you can be sure Martin won’t rest on his laurels, nor will grower Brian Mullany. We can look forward to a gradual tweaking of the style in the years ahead. Made from a selection of clones planted in 1995, Longview captures the essential character of the variety. Of medium hue, with brick reds rather than the crimson we might see in shiraz or cabernet of the same age, the wine delivers a range of delicious herbal, fruity, savoury characters. The texture is remarkably sensuous, albeit with nebbiolo’s signature farewell bite. 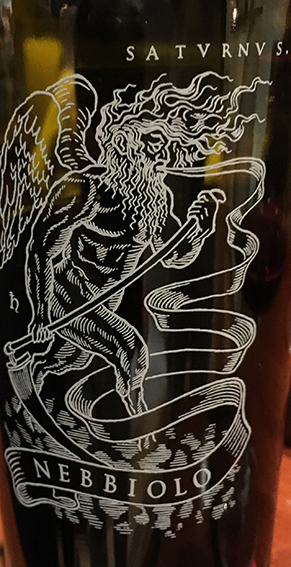 A friend, Ross Hanna, included this in a recent masked tasting wedged in between the robust and excellent Illuminati Zanna Montepulciano d’Abruzzo 2011 and the more comparable Patrizi Barolo 2013, reviewed below. What a performance from winemaker Rick Kinzbrunner making a wine of this dimension in eastern Australia’s cold, wet 2011 vintage. Clear varietal floral aroma and red-fruit flavours come with silky texture, underlying savour and long, firm-but-fine tannic finish. After much disappointment grabbing Barolos off the shelf, it’s good to see a clean, fresh version of the style. A pretty wine, because of its floral scent and appealing fruit flavour, it went to another level when strong, savoury tannins took over, giving the wine real Barolo character. A genuine and enjoyable expression of the style, showing more muscular tannin than the Aussie versions. Clonakilla Syrah comes from T&L block, the warmest site on the Kirk family’s Murrumbateman vineyard. From its earliest vintages the block, planted in 1999, ripened early than its neighbours and produced a distinctive, comparatively robust shiraz, albeit within the medium-bodied Canberra District spectrum. On first opening the 2016 showed its impressively fresh, bright floral and fruity character, set against fine, silky tannins. As the days rolled by, deeper, savoury flavours, including a charry oak character, pushed through, accompanied by assertive but still very fine tannin. The wine grew in dimension over five days on the tasting bench, pointing to a long and pleasant evolution in bottle. Clonakilla sources its chardonnay grapes from two growers in neighbouring Tumbarumba, 130 km from the winery to the south-west as the drone flies (220 km around two mountain ranges by car). These cooler growing sites suit the chardonnay grape, which gives intense, citrusy varietal flavour and high natural acidity. Barrel fermentation and maturation builds the mid palate, adds to the taut structure and gives subtle nutty nuances that complement the delicious fruit flavour. The growers: Steve Morrison (Revee Estate); Heather and Rob Johansen. 2017 vintages continues the finessing of Clonakilla’s oak-fermented viognier style. Noting a tendency for viognier to fatten up with age, winemakers Tim Kirk and Bryan Martin fine tuned vineyard and winemaking practice, finally settling on fermenting and maturing the wine in demi-muids – larger oak barrels with thicker staves (hence less oxygen transmission) than in traditional, smaller barriques or hogsheads. Recent vintages present viognier’s distinctive apricot and ginger varietal character with a little tannic grip and a touch of spice from the barrels – but without the variety’s sometimes viscous, oily texture. It’s a really lovely and distinctive wine. Ceoltoiri is Clonakilla’s take on Chateauneuf-du-Pape’s multi varietal red blend. The pale to medium colour belies the wine’s depth, combining seductive aroma with fresh, bright berry flavours and bags of spice. Like all the Clonakilla reds, the vibrant fruit comes with a layer of savoury flavours, fine tannins and smooth texture. This is a long way from big traditional Australian reds from warmer climates. But I’ve found rusted on fans of these styles also love the much lighter bodied Ceoltoiri. Why is this? Turns out it’s not so much the colour and body they enjoy, but juicy, ripe fruit flavours – which both styles have in common. Ceoltoiri achieves this without heaviness. Can any vineyard excel at both shiraz and pinot noir? For Clonakilla, whatever, the final verdict, it won’t be for a lack of trying. Tim Kirk’s shiraz-viognier and syrah (reviewed above) easily sit among the world’s best shirazes. Other Canberra District shirazes, too, rate highly in the Australian context. But Canberra pinot noir, while good, hasn’t yet drawn comparison with the best Australian versions in my notes. Clonakilla 2017 moves the quality needle in the right direction, albeit without bending it. Nevertheless, it’s a serious pinot backed by Tim Kirk’s ardour. He writes, ‘This pinot noir is lovingly made in tiny quantities. It’s a blend of fruit from the T&L block (clones 777, 115, Abel, Pommard) and the old, unidentified clone planted by John Kirk [Tim’s father] in 1978’. In this vintage a limpid wine displays attractive stemmy–stalky aroma and flavour, most likely attributable to the inclusion of whole bunches in the ferment. Mouth-watering varietal fruit flavour lies under this winemaker-induced character and it’s wrapped in fine, firm tannins that interplay with the whole-bunch character. Cellar door and release date for these five wines is Tuesday 1 May 2018. When I began wine retailing in 1976 Australians already drank impressive volumes of Champagne. Indeed for a time we were the only country buying more vintage than non-vintage product. Australia now imports around eight million bottles a year, though the mix favours non-vintage Champagne, a change driven partly by direct retailer imports and aggressive discounting by importers of some of the big houses. As well, consumption is now more widely dispersed through a society far more affluent and wine savvy than it was 40 years ago. Along with the shipping containers over the decades came a steady flow of Champagne personalities looking as if they could hardly believe their own good luck. Heads of houses, sales reps and titled family members spruiked – and continue to spruik – their wares across the country. They’re part of a great machine that markets, and tenaciously protects, not just individual brands but the Champagne brand as a whole. And it’s a very big luxury brand by any measure. According to Comite Champagne, in 2016 the region sold 306 million bottles worth 4.7 billion Euros. Exports accounted for 48 per cent of volume and 55 per cent of value. Australia ranked sixth biggest market by volume, behind the UK, USA, Germany, Japan, and Belgium. All of those countries, Belgium excepted, have vastly bigger populations than Australia’s 24.8 million people. Little wonder then the Champenoise regularly visit our shores. Christian Pol Roger, a once regular visitor to Australia. One of note, I recall, was the gracious, generous, hard-working Christian Pol Roger from the Champagne house of the same name. He’s retired now, but visited Australia over quite a long period. On one visit in the mid 1980s, we asked and he accepted our invitation to a tasting at the Farmer Bros Wine and Spirits warehouse in the inner Sydney suburb of Waterloo. We promoted Pol Roger’s visit through our monthly wine newsletter and a full-page advertisement in the Sydney Morning Herald. Here was an opportunity, we said to customers, to meet the famous Mr Pol Roger and pick up a magnum or two at a great price. Mr Pol Roger worked tirelessly through a busy Saturday, talking to customers, pouring wine, and signing magnums – a task well removed from the usual smaller scale trade tastings he traditionally hosted. His labours proved a huge success for us commercially, for the Pol Roger brand and for the many customers who met him and enjoyed his Champagne. Visiting Champagne heads customarily dispense largesse to the trade, as we well knew from long experience. They’ll wine you, dine you and leave you with a good impression of their product. On this occasion, however, we insisted Christian be our guest at Berowra Waters Inn – an invitation he accepted graciously but with some surprise. 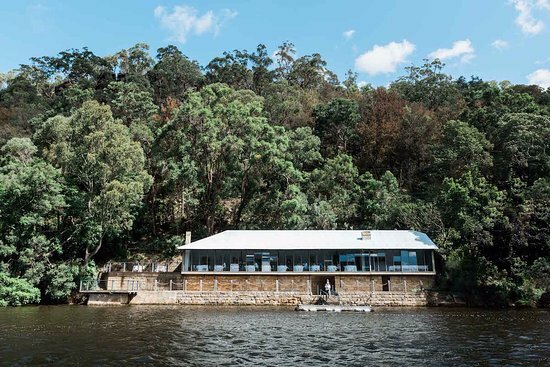 Under Gay Bilson, the waterside restaurant, located in one of Sydney’s remote and dramatic sandstone gorges, was then at its outstanding peak. Bilson had recently converted her wine list to an all-Australian affair, with one exception, a house Champagne. From memory (possibly unreliable) it was Louis Roederer, though certainly not Pol Roger. We also knew from experience visiting Champagne heads understandably prefer to drink their own product. I therefore took the precaution of phoning Gay Bilson ahead of the dinner and asking if she’d adopt Pol Roger as house Champagne for the evening. She understood the situation and obliged. On a balmy Sydney evening we drove Pol Roger to Berowra. Delighting at the beautiful bush, sandstone and water setting, Pol Roger stepped into the aluminium skiff for the short ride to the restaurant. Bilson greeted us at the door, Pol Roger Champagne was poured and we sat down to a memorable Bilson meal in the unique setting. More than 30 years later the Champagne folk continue to arrive, the latest being a Canberra visit by Francois Colas, representing Champagne Bruno Paillard, a comparative newcomer to the region’s ranks. 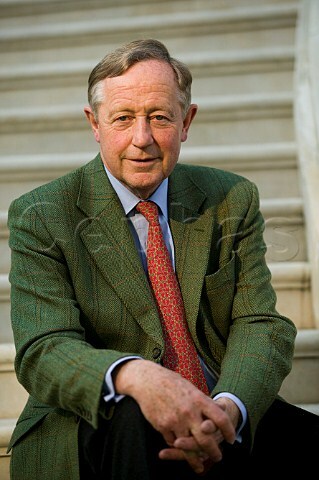 Bruno Paillard founded the company in 1981 and for the first 10 years bought grapes from growers. From 1984 he began acquiring vineyards, initially in Oger, and now owns 33-hectares spread over 17 villages. Colas says the company now controls two thirds of its grape sourcing and buys the rest. Grapes come from 35 villages. Bruno Paillard continues to run the business while gradually handing control to his daughter Alice. The wines are very much in Champagne’s ‘built’ style. Fruit flavour underpins the blends. But winemaker inputs add many layers to texture and flavour. For Bruno Paillard these influences include barrel fermentation of 26% of all varietal components; extensive use of older reserve wines (up to 50% in the non-vintage), prolonged ageing on yeast lees, followed by six-months to three years maturation after disgorgement. An impressive NV (or multi-vintage as Paillard calls it), showing the benefit of extended ageing on lees. Many NVs on the market show simple fruit flavours and lack the depth of those aged on lees. Paillard’s offers delicious fruit flavours coated in Champagne’s lovely add-ons, in a fine, lean, taut style. From a great Champagne vintage, the wine combines freshness, the structural and flavour characters of long maturation on yeast lees, and delicious underlying fruit character. Pinot flavours push through while the chardonnay is probably behind a zingy, fresh, lemony finish. A little over 11 years old on tasting, Blanc de Blancs belied its age with a shimmering med-lemon-gold, green tinted colour. The freshness suggested by the colour came through in the aroma and palate as a vibrant pear-like character. However, the backbone derived from lees ageing, along with a subtle almond-like character, contributed to the lingering, satisfying finish. Made only in great vintages. Disgorged 2014. A beautiful, elegant Champagne, layers of flavour, firm but fine structure with finesse. Pinot noir with a splash of chardonnay. Three years on lees. A powerful and fine rosé built on pinot noir varietal flavour and the variety’s firm backbone, augmented by its three years on lees. Bruce and Chris Tyrrell, viticulturist Andrew Pengilly, winemaker Andrew Spinaze. Bennelong Restaurant, Sydney Opera House, 20 March 2018. Tyrrell’s turns 160 this year. Marking the anniversary, Bruce Tyrrell, his son Chris, winemaker Andrew Spinaze and vineyard manager Andrew Pengilly held a tasting of Vat 47 Chardonnays, vintages 2004 to 2017. With Murray Tyrrell’s release of the 1971 vintage, Vat 47 became one of the earliest Australian wines labelled ‘chardonnay’ (albeit as ‘pinot chardonnay’, an historical misnomer that stuck for 30 years). 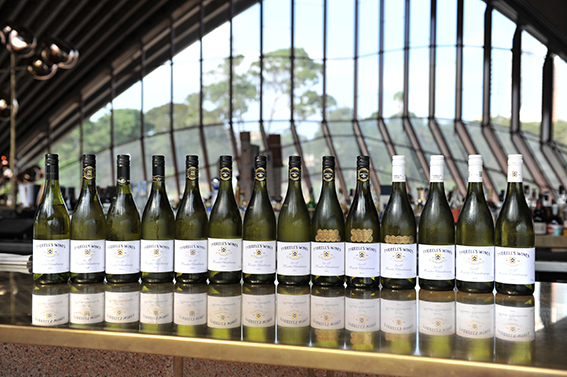 It remains one of Australia’s great chardonnay styles, with proven long-term cellaring capacity. Vat 47 evolved over the years from a leaner, long-cellaring style in the 1970s to a fatter, shorter-lived, Californian-inspired version in the 1980s, and back to a finer style from the late 1980s. Introduction of the screw cap in 2004 and improvements to fruit sourcing, winemaking technique and oak maturation lifted the quality another notch over the past decade. The 14-vintage sequence revealed Vat 47’s continuing style evolution and the profound impact of the screw cap – ‘Perhaps the greatest step forward…[it] saved Vat 47’s reputation from the damage done by dud corks’ says Bruce Tyrrell. Tyrrell said, ‘Chardonnay’s moved on across the country but Vat 47 has never stood still. It’s not stuck in the past’. He said the vintages on tasting deliberately started with the 2004 (the first vintage sealed with screw cap), and revealed other influences, including a gradual shift from partial basket pressing in 2007 to 100 per cent in 2013. At the same, Tyrrells had been eliminating several vineyard sources from the blend. By 2013 sourcing had retreated solely to the Short Flat Vineyard across the road from the winery –site of the company’s original 1960s chardonnay plantings. ‘There’s a day will come now that Vat 47’s off a single vineyard that there’ll be a gap in a future vertical tasting. We won’t elevate a wine just to have a Vat 47’, says Bruce. 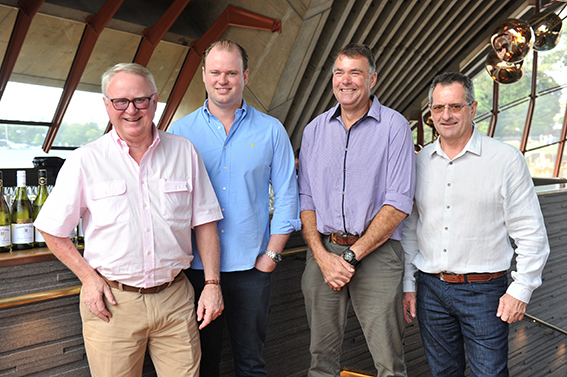 Changes to fruit sourcing and winemaking over the last decade were driven by a desire, ‘to improve the Hunter Valley style or be left behind by the cooler climate areas’, write Bruce Tyrrell and winemaker Andrew Spinaze. ‘We are not a cool climate area and you cannot change your identity but you can modify your style’. Winemaking changes included the introduction of basket pressing (improving flavour and texture and increasing natural acidity), elimination of pectin enzyme additions, increased spontaneous fermentation and ongoing work with French barrel cooper Francois Frères to ‘create a barrel that suited what we are trying to achieve in our final style’. Future tweaking will likely come more from work in the vineyards than in winemaking. Says Chris Tyrrell, ‘There are so many great chardonnays we need to lift the bar and focus on the best blocks [in the Short Flat vineyard]’. Even the 14-year-old 2004 Vat 47 (bottom left-hand) retains a vivid lemon-gold, green-tinted colour. In the cork-seal era we might have said the colour belied its age. What we now know is that well-made whites protected from oxygen under screw cap take on deeper colours very slowly, not dramatically, and in wide variations, as they do under cork. The limited colour spectrum from youngest to oldest wine in the tasting mirrored the subtle shifts of aroma and flavour attributable to age. Yes, the wines changed with age, but in pleasing ways, combining freshness with bottle-aged character. What a contrast to earlier vertical tastings of cork-sealed Tyrrell’s whites, where random oxidation, caused by corks, marred many bottles. Every bottle opened bright, fresh and with vivid, green-tinged colours. The older wines presented beautiful nutty and honeyed characters of age, while remaining fresh and vital. The spectrum of aromas and flavours faithfully captured the character of each vintage. For example, the neighbouring 2007 and 2008 vintages reflected the full flavour of a hot vintage and the more subtle, citrusy character of a cold, wet year respectively. Likewise, the 2012, from another cold, wet vintage, allowed some of the winemaking inputs to push above the fruit character, without overwhelming it. The current release 2014 showed its gentle, melon-like varietal flavour on a mouth-filling but tightly structured palate. However, in a flawless line-up among many beautiful wines, two wines topped my scoresheet: 2009 and 2013. Here’s a couple of earlier pieces on Vat 47 plus one on the introduction of the screw cap. Interesting wines begin not in the vineyard, as conventional wisdom has it, but in the mind of the winemaker. The grape variety mondeuse entered Frank van de Loo’s mind in 2002 and 2004 during tastings in France’s Savoie region. He planted the first small plot of the variety in 2010 and subsequently expanded it to 0.4 hectares. That little plot of vines now produces a unique red that was but a thought bubble just four years ago. Medium bodied in the Canberra mould, it offers delicious, ripe fruit with striking spice, herb and black pepper character. Frank van de Loo planted the Spanish varieties tempranillo and graciano at Mount Majura earlier this century. Tempranillo became the vineyard’s signature red while the smaller production graciano graces blends as well filling its own special niche. As a very late ripener it’s at risk of not maturing in the Canberra climate. However, the balmy 2017 autumn ripened the variety in late April. The resulting medium bodied wine captures graciano’s floral aroma, soft tannins and plush, pepper-tinged vibrant fruit flavour. It’s another red of great individuality. Named after the site of an old lime kiln near the vineyard, Mount Majura’s new red combines shiraz (50%) with mondeuse (25%), touriga (20%) and tempranillo (5%). Frank van de Loo says, ‘With such a collection of interesting varieties in the vineyard and winery, new blending trials are irresistible fun’. The blend takes spicy-fruity Canberra shiraz as a base, then throws in floral, spicy, peppery and herbal notes of the other varieties. It’s medium bodied, soft, smooth, and a delight to drink now. Mount Majura vigneron Frank van de Loo welcomes another trouble-free Canberra vintage. Located about 100km inland with vineyard altitudes between about 550 metres and 860 metres, the volume of the district’s harvest varies widely across any given decade. Frost, wind, hail, and sustained cold weather have all at times reduced the region’s harvest and at times wine quality. But as vintage gets underway for earlier ripening varieties, clear blue skies, warm days and cool nights – following a generally benign growing season – means ample crops of ripe, disease-free grapes in 2018. Most reds remain on the vine with harvest due to commence in the next few weeks. 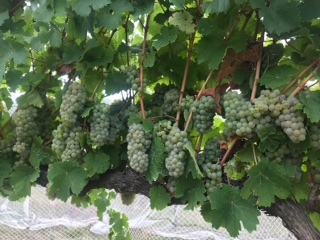 Picking of riesling, the district’s signature white variety, is imminent in some parts of the region. The vintage will likely stretch into April or even May for some varieties and sites. 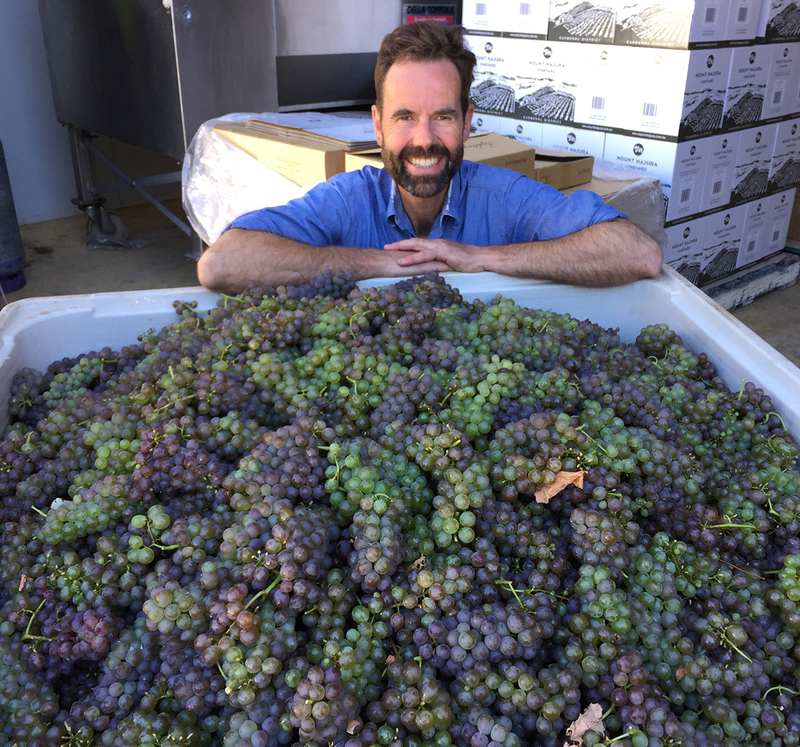 Mount Majura Vineyard’s Frank van de Loo with pinot gris grapes, Friday 9 March 2018. He’ll chill the grapes overnight before they’re crushed and fermented. Mount Majura’s clean, ripe pinot gris. Note the distinctive colours. Now you know why there’s sometimes a blush of pink or grey in wines made from the variety. © Copyright Chris Shanahan 2018. Published 9 March 2018. Ken Helm grows grapes and makes wine at Murrumbateman in the Canberra District. He also sources riesling grapes from neighbouring regions of the New South Wales high country on the western slopes of the Great Dividing Range. In the 2017 vintage, working from a new, dedicated riesling cellar, Helm produced three rieslings from the Canberra District and one each from Tumbarumba and Orange. ‘Murrumbateman’s the centre of the universe’, reckons Helm. Hence, I took great trouble to locate his village in the middle of the map below. Tumbarumba lies 130km to the southwest of Murrumbateman, while Orange is 190km to its north. The three sites share a continental climate – amplified by altitudes between 600 and 700 metres – resulting in warm days and cool nights during the autumn ripening period. In these conditions, the late-ripening riesling grape develops clear varietal character while retaining fresh acidity. The wines present subtle variations of riesling, driven largely by minor differences in growing and ripening temperatures of the sites. Winemaker Ken Helm draws riesling grapes from Tumbarumba and Orange in the New South Wales high country in the vicinity of his vineyard and winery at Murrumbateman (marked red, centre). 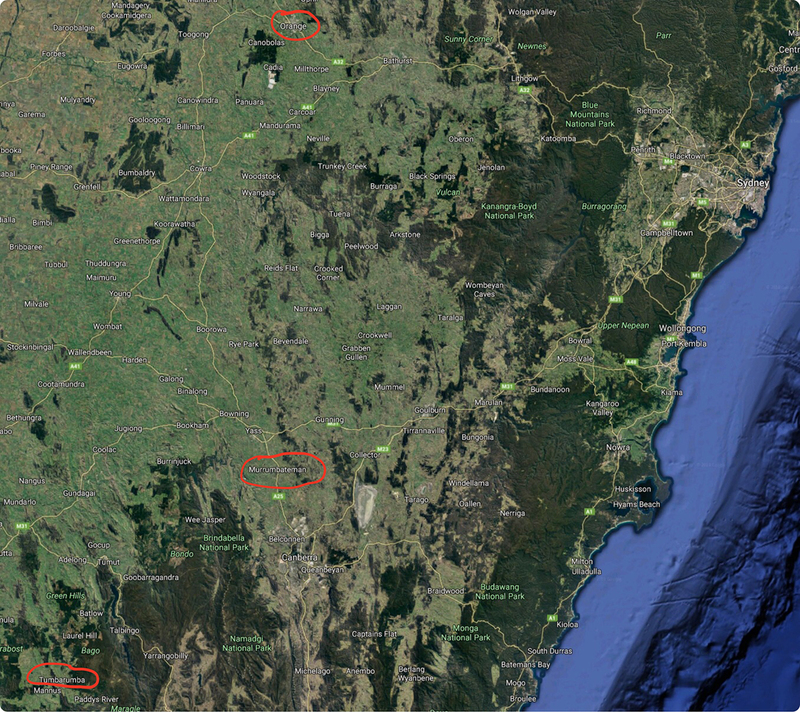 Orange is marked red at the top, while Tumbarumba lies to the south west, bottom left hand corner. These are all at 600–700 metres altitude on the western side of the Great Dividing Range. Sydney is on the coast, top right-hand corner. The grapes come from Juliette Cullen’s Tumbarumba vineyard at 620-metres altitude. The site’s cooler and wetter than Helm’s at Murrumbateman and probably explains the apple- and pear-like character widening the spectrum of the usual floral and citrus nature of riesling. The shimmering fresh palate finishes bone dry, with scintillating acidity. Although Orange lies 190km to the north of Murrumbateman, growing temperatures are lower, influenced by cool air flowing from Mount Canobolas, the seminal landmark of the region, and the 700m altitude of the vineyard. The wine presents Granny Smith apple-like characters, cut with tangy lime-like acidity and flavour. It’s bone-dry and taut as a high wire. Helm’s original riesling, now in its fifth decade of production, presents a tangy, lemony side of riesling with notably rounder, fuller palate than the more austere wines from Tumbarumba and Orange. That extra body and up-front fruitiness mean absolutely delicious drinking now. But naturally high acidity and a decades-long track record mean you can cellar this wine for ten years or more and enjoy its flavour evolution along the way. Possibly the best wine yet under this label, the 2017 is for the second time sourced entirely from Ken’s 2008 vineyard planted to the Pewsey Vale riesling clone. Previous vintages, with the exception of the 2016, came from the neighbouring Lustenberger vineyard. The wine presents the combined power and delicacy of riesling, with amazingly concentrated lime-like varietal flavour. The flavour lingers in the purest most delicious way. With 12 grams per litre of residual grape sugar, Helm Half Dry lives up to its name, being neither dessert sweet nor bone dry. The sugar and fruit combine to give a plush, full mid palate, while high natural acidity prevents the cloying sensation that comes with unalloyed sweetness. Unlike the Helm dry riesling, this one’s intended for early consumption, not cellaring. It pairs well with all sorts of spicy and (chilli) hot food. Ken Helm’s photo 8 March 2018, a week out from vintage. It could be the biggest crop ever says Helm. They look yummy, don’t they. © Chris Shanahan 2018. First published 8 March 2018. In 2017, Lonely Planet rated Canberra third best city in the world. But in keeping with a decidedly riesling mood enveloping the Capital’s winemakers, Gallagher Canberra Riesling 2017 topped 519 wines from seven countries in the Canberra International Riesling Challenge. Murrumbateman winemaker Ken Helm founded the challenge 17 years ago. At the time, Canberra riesling, though very good, lived in the shadow of Canberra shiraz, which had attracted the attention of world critics by the perfumed beauty of Clonakilla’s shiraz–viognier blend. Helm’s dogged pursuit of riesling as the region’s white specialty gathered momentum. The challenge became a practical workshop for local riesling growers and makers. Their expertise, applied to a variety well suited to Canberra’s climate, produced rieslings that increasingly stood comparison to the best in Australia – indeed to the world, as Gallagher demonstrated this year. Show judges loved the style. And the love spread to wine waiters and consumers in Canberra, Sydney and Melbourne. Although the absolute volumes remain small on a national scale, Canberra riesling is achieving demand matched by few producers of the variety in other regions, Tasmania excepted. Long before Canberra’s 2017 vintage commenced, winemakers scrambled for riesling grapes. With supply no longer meeting demand, grape prices shot up. 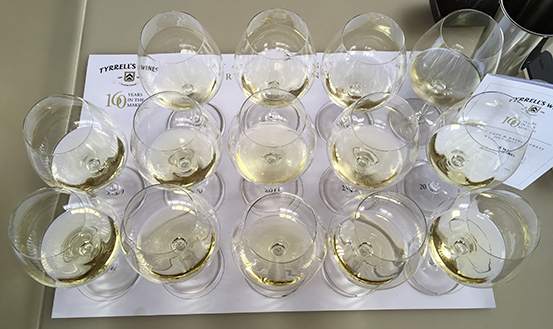 During vintage winemaker David O’Leary called riesling the district’s hot variety. “Everyone’s after it”, he said, “including out-of-district makers. And if you can find it, expect to pay $2000 a ton”. Only Tasmanian riesling fetched more, at around $2300 a ton, he added. O’Leary sees no let up for the coming vintage even though early signs point to another bountiful harvest in 2018. He says, “A lot of people are chasing it, but finally the [grape] price reflects how much the wine can sell for”. He expects the price to remain around $1800–$2000 a ton in 2018. Like others in the district, O’Leary is either planting more riesling or grafting it onto less popular varieties, setting the scene for increased supply over the next few years. If riesling attracted perhaps the most attention locally this year, our winemakers made beautiful and sometimes quirky wines across a wide range of styles. Shiraz remains the district red specialty, though some makers say the sheer number of labels on offer now makes it harder to find restaurant listings or retail shelf space. Partly for that reason, Nick Spencer, recently departed from Eden Road Wines, plans on offering reds from warmer Gundagai under his new Nick Spencer label. He reckons using appropriate varieties (shiraz, cabernet sauvignon, touriga and grenache) in warm-climate blends makes a good narrative and an alternative style for drinkers. But for most, shiraz remains the main game in a wide and deep district offering. My gong for Australian shiraz of the year goes to Clonakilla Syrah 2015, a remarkable small-production wine from the warmest site on the Clonakilla vineyard. The wine never wins medals or trophies for one reason – winemaker Tim Kirk doesn’t enter it in wine shows. However, Frank van der Loo shows his shiraz, and in November his Mount Majura 2015 won the Chairman’s Award at the National Wine Show of Australia. Former Canberran Jim Chatto wrote, “I generally look for a wine of excellent quality and character. My Chairman’s Award goes to a beautifully expressive cool climate shiraz from Canberra. Amazingly this very same wine was the runner-up to my award last year”. Canberra shiraz fared well at the NSW Wine Awards, too, where Lerida Estate won the best young shiraz trophy. At the same show, Shaw Vineyard Estate Cabernet Shiraz 2015 topped the best young red blend category. Canberra’s production of so-called alternative varieties continued to expand in 2017. Our makers now work with, among others, graciano, tempranillo, sangiovese, gamay, nebbiolo, colorino, mammolo, refosco, mondeuse, canaiolo, aglianico, nero d’avola and cinsault. Of these, sangiovese and tempranillo became mainstream some years ago, with conspicuous success for Mount Majura’s tempranillo, now its signature variety, and its gold-medal winning mondeuse and TSG (tempranillo-shiraz-graciano blend). 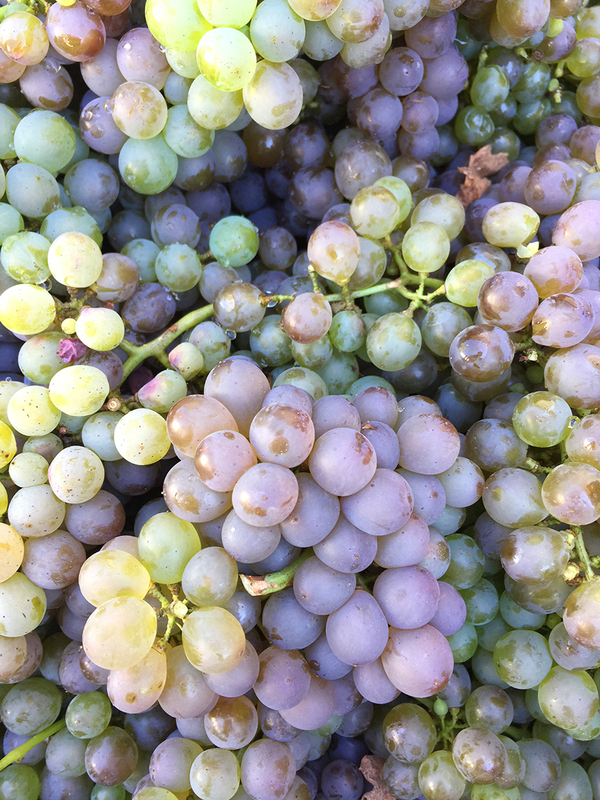 In 2017, Pankhurst Wines, Hall, produced its first whites from marsanne (Rhone Valley origin) and arneis (Piedmont origin), varieties Allan Pankhurst grafted onto semillon and sauvignon blanc rootstock a few years earlier. 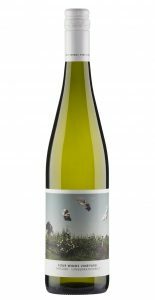 The wines, made for Pankhurst by Capital Wine’s Andrew McEwin, give us a new expression of marsanne, no newcomer to Canberra, and I believe our first glimpse of Canberra-grown arneis. The marsanne 2017 ($25) provides full, fresh flavour with the distinctive viscosity of the variety. Arneis 2017 ($30) shows a racy, pleasantly tart character and bone-dry finish. In 2017, awards of another kind came to Four Winds Vineyard. In March the vineyard’s new label became “supreme champion” of London’s Drinks International Wine Design Challenge. Five months later, and still in London, the labels were awarded “best redesign” and “supreme champion” at Harpers Design Awards. In May, Wine Australia selected Four Winds’ Sarah Collingwood for its Future Leaders Program. Then in September Collingwood won Owner-Operator of the Year in the Australian Women in Wine Awards. 2017 also witnessed generational change at three wineries: founders Jim Lumbers and Anne Caine sold Lerida Estate, Lake George, to Michael McRoberts. Roger and Faye Harris sold Brindabella Hill, Hall, to Michael Anderson and Renae Kilmister. And Brian and Janet Johnston sold McKellar Ridge to John and Marina Sekoranja. Lerida’s operations manage Andrew McFadzean, says new owner Michael McRoberts’ long-term plans include doubling the winery, barrel cellar and cellar door capacity as production lifts from 130 tons in 2017 to 300 tons. 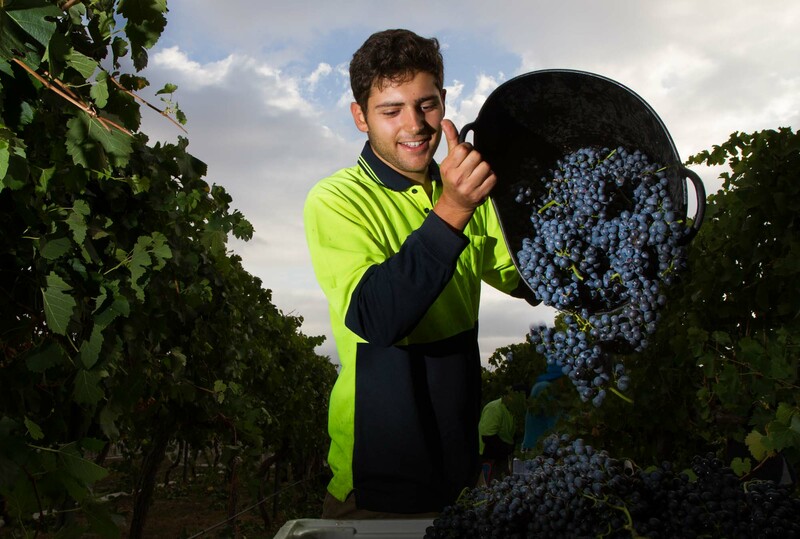 McFadzean expects to source grapes from neighbouring regions, including Hilltops and Orange, as well as Canberra. “We want not just more wine, but excellence in everything we do. We want to give customers a great experience in wine, at the cellar door, in restaurants and when they drink our wines at home”. Lerida now offers cellar door sales and food service seven days a week. Brindabella Hills’ vineyards had been out of action for a couple of years. But new owners Michael Anderson and Renae Kilmister retained chef Robyn Cooper and winemaker Brian Sinclair. The couple then “worked around the clock for weeks”, says Anderson, revamping the vineyard and renovating the cellar door and café. They have further plans to add a big new deck to the café, with views to the Murrumbidgee Valley and also to renovate and move into the Harris’s former house. At about the time John Sekoranja decided to leave corporate life and buy a winery or vineyard, he met McKellar Ridge founders Brian and Janet Johnston. Instant rapport led to a sales agreement. McKellar Ridge changed hands in June 2017. But before that Sekoranja and wife Marina had worked vintage with Brian Johnston and both had enrolled in the wine science degree at Charles Sturt University. They plan to modernise the cellar door, continue with the wine styles the Johnstons established and “expand and diversify the range”. They’ll experiment a bit with an existing tempranillo style and add a sparkling riesling to the range. The Sekoranjas also plan to add sangiovese to a new one-hectare shiraz and riesling vineyard they planted at their home in Wallaroo Road, Hall. And at Eden Road Wines, Murrumbateman, winemaker Nick Spencer left to create his own brand. His departure opened the door to another exceptionally talented winemaker, Celine Rousseau. Rousseau made many beautiful Hilltops and Tumbarumba region wines at Chalkers Crossing, Young. She now manages Eden Road and heads the winemaking team. Change is also underway at Jeir Creek Winery, Murrumbateman. Founders Rob and Kay Howell put the winery and vineyard on the market recently and hope to find a buyer in the near future. Meanwhile, Rob Howell remains on the vineyard and says, “Beautifully timed rain boosted the vines and inflorescences [that precede flowering, then fruit set] suggest it’ll be a big crop [in 2018]”. Howell’s Murrumbateman neighbour, Ken Helm, felt apprehensive during his driest July–August on record. He said, “I’d just planted a new riesling vineyard, but glorious rain arrived just in time. Now I look in the riesling vineyards and I’ve never seen inflorescences like this. Every shoot has two bunches, some have three. It could be an enormous crop”. As 2017 draws to a close and we enjoy this year’s Canberra whites and last year’s reds, vignerons remain hopeful of another decent crop in 2018 – giving Canberra a rare run of three consecutive decent vintages. But there’s a lot of weather to come before vintage, so let’s celebrate what we have now and hope for the best in 2018. Gallagher 2017 beat 519 rieslings from seven countries to be named best wine in October’s Canberra International Riesling Challenge. The wine also won awards as best dry riesling, best Australian riesling and best from the Canberra District. In comparison, judges at the recent Canberra and Region Wine Show struggled with Canberra’s 2017 vintage rieslings, awarding a miserly one gold medal in a field of 30, with a bronze to Gallagher’s wine. The Riesling Challenge judges got it right for this exciting, vivid dry riesling. Greg Gallagher sourced the fruit from Briar Ridge and other Murrumbateman vineyards. To be released mid December. Winemaker Frank van de Loo captures the spirit of Canberra riesling, writing: “Ah, riesling! White blossom and lemon essence, along with the indefinable riesling-ness that is somewhere between aniseed, cold steel and crushed herbs. Purity and delicacy to the fore. We love its delicacy, fragrance and personality”. His 2017 reveals all those virtues in a style that can be enjoyed now in its vibrant youth, or savoured over the years as it grows deeper and more textured with age. Winner of gold medals at the NSW Wine Awards and Royal Melbourne Wine Show. By a small margin my favourite of the rieslings reviewed today comes from Four Winds Vineyard, Murrumbateman. Graeme and Suzanne Lunney planted the vineyard in 1998 and 1999 to supply Hardys. Today, daughter Sarah Collingwood manages the business while husband John Collingwood tends the vineyard; daughter Jaime Crowe and husband Bill Crowe make the wines on site at a separate business, Highside Winemaking. The family’s 2017 riesling appeals for the intensity of its lime-like varietal flavour and brisk, invigorating acidity. Judges at the prestigious 2017 Winewise Small Vignerons Awards named it top wine of the show. Mount Majura tests a range of varieties, including Spain’s tempranillo, which produced lovely wine from the very first vintage in 2003. It sustained the performance and at this year’s Canberra and Region Wine Show won the “Wine of Provenance” award for the outstanding quality of three vintages tasted side by side: 2015, 2009 and 2004. The just-released 2016 offers a limpid, crimson colour, highly perfumed aromatics, combining red berries and deeper savoury notes. The buoyant palate reflects the aroma. It combines fresh, lively young fruit flavours, which make the palate deliciously fleshy, with underlying black-olive-like savour and satisfying, firm tannins.